Killer earbuds, all the way from Scotland. It would be a bit of an understatement to say that the in-ear headphone market is congested. But through its precision engineering and already acclaimed audio performance, RHA - a Glasgow-based company specialising in in-ear tech - has already managed to attract plenty of attention. This has been helped in no small way by some heavyweight retail partners, including the Apple Store Network, where RHA are already rubbing shoulders with industry leaders such as Beats and Bose. Their flagship model, the T20i, comes in two variations, where the non-i model (T20) is the virtually identical set but without mic and player controls. There is the monetary difference between the two as well (around 20 bucks) and if you are using an ‘i-player’, it would make all the sense to go for the ‘i’ version, especially if you are already planning to part with over two bills for headphones. For this not unsubstantial amount, RHA offer you quite a luxuriously-packaged set, with a lot of extra candy thrown in. In the stylish box, you will find a selection of ear tips (dual density silicone, double flange silicone and memory), three interchangeable tuning filters, stainless steel ear tip and filter holders, and to put all of it in, a premium carry case. All this makes the the unpacking a joyous experience. Holding the in-ear pieces for the first time, they feel assuringly premium and heavy to the touch. The chunky weight of these buds is due not only to the steel capsule housing, but also to the fact that they each hold two separate coils, working in a similar way as to how a bass driver and a tweeter work in speakers. This approach was until recently only reserved for much more expensive units and is famed for its clarity, as it allows each voice coil (think mini-speaker) to handle separate frequencies, and work far more efficiently. To further that, the previously mentioned tuning filter caps (fitted as a screw into the ear capsules), provide a fairly subtle but noticeable alternative to the regular ‘reference’ filters. RHA’s mouldable over-ear hooks deserve a special mention, too. Their simple, bend-and-forget, over-the-ear approach really helps achieve a tangle-free wear and steady fit, which will be appreciated big time if you are into jogging, cycling or just jumping around to the music. Since we’re speaking of fittings, we strongly recommend, before reaching out for a different pair of filters, that you make sure the buds are fitted perfectly in the ear cavity. The supplied additional ear tips are there for that reason - selecting the correct earbud size would result in a world of difference and the best possible performance. You often hear of high-definition sound being described as warm and organic. Well, at first listen the T20i’s are anything but. What you get instead is a clear and neutral audio picture, more cool and distant than other models. One possible reason is that these in-ears are not that easy to drive - you need to turn the level up a bit (and there are good reasons for that from design perspective). But within a couple of days of use with the ‘reference’ setting, we noticed a warming change, as if that slight tightness in the mids had been loosened up by continued use. Indeed, the T20’s really need a bit of mileage in order to hit the sweet spot. The filters (colored in black for bass, copper for treble and silver for reference) do change the overall audio character as expected. If you love extra bass, you will love the bass caps - they bring a wealth of ‘oomph’ and depth to the low end. The copper-colored treble filters really do add airiness to your music, with enough extra sizzle, but thankfully no harshness. We recommend these to anyone who were a teenager more than a few winters ago (our aural perception of top frequencies diminishes with age). Our favorites, though, are the regular ‘silver’ reference caps. They are, simply, the bomb. It’s perhaps worth noting that with the quite impressive level of external noise isolation and broad-sounding overall performance, it’s best not to crank these up too much. 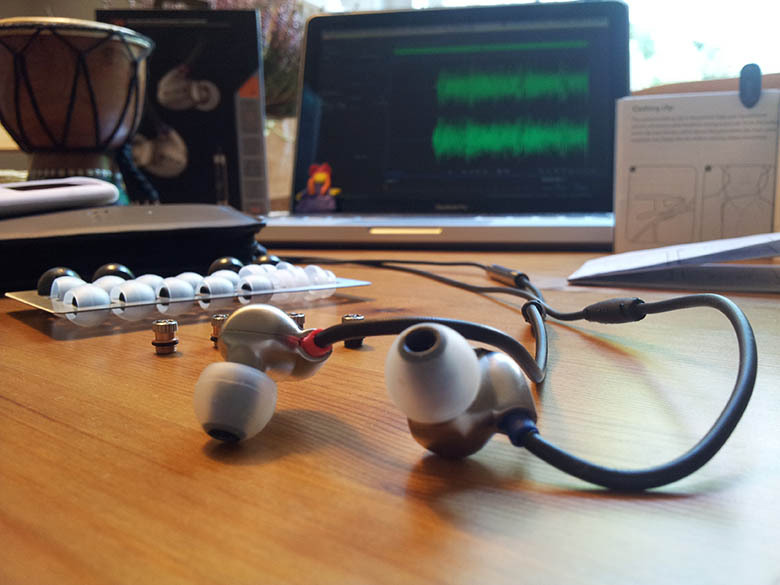 This goes for any in-ear type headphones for that matter, as when pushing sound directly in your ears, high volumes can result in somewhat reduced audio separation, even with such mid-to-high end products. More importantly, you might want to keep your hearing intact in the long run. For the few weeks we spent with the RHA T20i’s, our listening sessions proved to be a real pleasure. Music suddenly has that new ‘remastered’ vibe, and indeed many favorite pieces (in wildly varying genres) were revisited in order to be experienced again and yet again through this set. Not as loud as your bargain bin headphones, can sound a bit ‘dense’ or ‘congested’ at high volumes, require a bit of burn-in to get the best sound. With Shure being such a well known brand, it’s not surprising that this worthy pair of in-ears has amassed a big following and quite a few industry awards. The spec is nearly identical to the T20’s, the main difference being in the Shure’s detachable lead, which is really handy. The SE425s also come with a nice accessory kit, but without the cool and really versatile interchangeable filters of the RHAs. Another similar mainstream favorite are the Sennheiser IE 80’s. It comes from another stellar brand, which (to be honest) took a while to offer something really decent as far as in-ears go. This model is similarly priced but, although sounding very good, does not use the dual-coil approach of the RHAs and the Shures. Still, they have a detachable cable and although they have no additional filters, they do offer a bass tuning function allowing you to increase or reduce the low end to taste.